Many students have been approaching me time and again in individual capacity requesting for supply of objective question and answer book available if any with me to help them attend the interviews. Since I have already given away all my books to few students many years ago, I am publishing the question and answer series in printing in order to help the those students who attend the interviews. 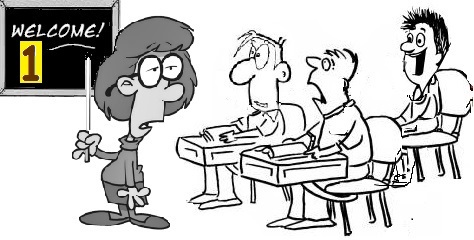 The articles are meant to help the students gain knowledge and effectively compete in the interviews and nothing else. Please note that these are not to be published by anyone for commercial purpose without the written permission from the author since the theme and illustrative examples have been compiled exclusively by the author for the benefit of the student community. THIS WILL BE PERIODICALLY PUBLISHED. 1) What are the basic printing processes? 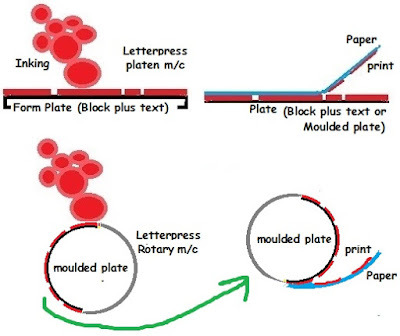 2) Explain the basic principles of the above four printing processes? Printing with relief plates where the image areas are in raised position where as the non image areas are much below the image areas. Image transfer is directly on paper from the printing plate which is called forme plate or from moulded plates as it contains both composed text material and illustrative blocks, both of which are tightened together on the forme plate. The forme plate is used on flat bed platen machines while the moulded plate is mounted on rotary machines. The ink used is neither liquid nor stout but is solid and soft. These days instead of moulded plates Photo Polymer plates are used. 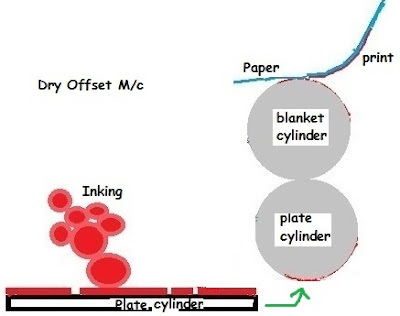 The inking system in both platen and Rotary machine is also in direct contact with printing plates. Printing of multi tonal image by halftone process is possible. Printing with metal plates having both image and non image areas lying in the same plane (same surface). This process works based on oil and water repellent theory. Paper is not in direct contact with printing plate, but gets the image transfer through intermediary blanket cylinder. The inking system is in direct contact with printing plates, but additionally one more dampening system is also in direct contact with the plate. First the dampening system dampens the plate followed by the inking system which inks the plate. The ink used is neither liquid, nor stout and fairly solid, but not to the extent of Letterpress machine inks and is soft. 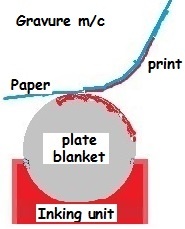 The image from the plate gets transferred on to a blanket cylinder which in turn transfers the image on to the paper. 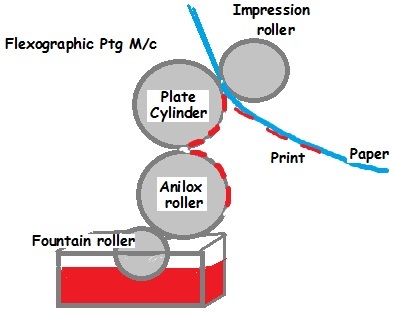 Printing with plates having image areas in sunken portion of the cylinder. 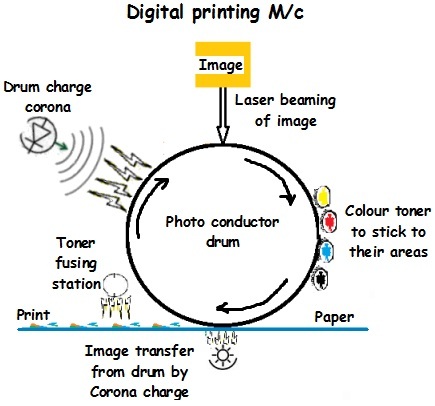 Image transfer is directly on paper from the printing plate (Cylinder). The inking system is in direct contact with the plate along with a wiping system (Doctor blade) which removes the excess ink from the non image areas of the plate surface. The ink used is liquid in nature and not soft or solid. Printing of multi tonal image by halftone process is not possible, but with the use of a different other type of screen, multi tonal color printing is made possible. In this process a thin mesh screen works as the plate to transfer the images. The image areas will be left open and non image areas are blocked on the mesh screen. 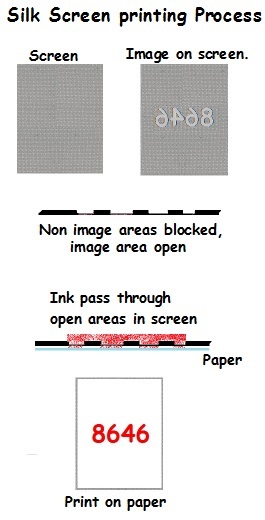 Image transfer is directly on paper from the image carrying mesh. The ink used is loose and semi solid. The printed images will give slight relief feel when rubbed by hand. Printing of multi tonal image not possible. Only line work with cut colours can be printed. 3) What are the other known printing processes? Briefly explain them. This is based on Letterpress printing. Instead of relief metallic plates or blocks, rubber stereo with embossed image is used as printing plate. Image transfer is directly on paper from the rubber stereo plate. The inking system is also in direct contact with printing plates. 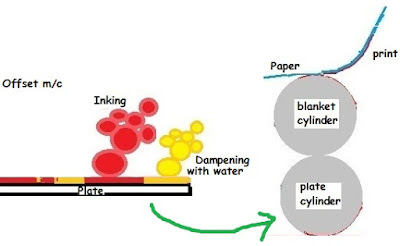 The basic principle is same like Letterpress printing but instead of oily ink, liquid water or alcohol based ink is used to facilitate quick drying on the printed surface . This is combination of Wet offset and Letterpress printing processes. The plate used for printing is similar to Letterpress printing i.e the images are in relief form on the plate which receives the inking directly from inking system without intermediate dampening system. The image from the plate is not directly transferred on to the paper. Instead the image from the relief plate is first transferred on to the blanket cylinder which in turn transfers it on to the paper. This is offshoot of Gravure process. 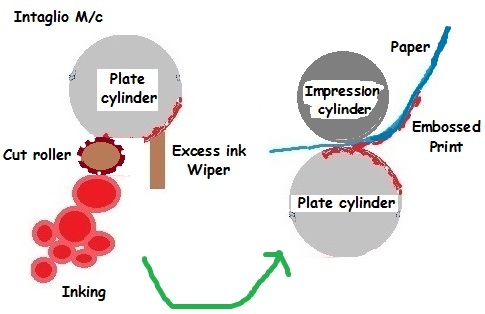 The principle is same- printed image in etched portion of the cylinder- but instead of liquid ink, very hard and stout ink is used to print the image which will give relief effect on paper which can be felt by hand by rubbing over the printed image with finger. But it has to be tested only after ink dries, lest the printed ink will come out. In one plate where the images are engraved, multi colored ink can be applied by specially cut rollers to print multi color images, but they will be cut colors only and not not give the effect of colour effect by super imposing process. The ink is applied on the plate through an intermediary cut roller which has specific color image areas carved out on them. This is based on the Xerox process which in one sense is an offshoot of Offset process. At one point of time direct typing or drawing on a paper based plates with laminated coating on their back used to be fitted on small offset presses and printed. They were known as Rotamasta plates. Like oil and water repellent theory which was the basis of wet Offset printing, the Xerox works on the principle of opposing negative and positive ions. The positive ions charged on the photo conductor drum absorb the powdered ink instead of oily ink which is used for transferring the image in other conventional processes and transfers it on to the paper by corona charge. 4) What are the two major divisions in the printing process ? The two major divisions of printing process are grouped as Security printing and Non Security printing. Printing the images without carrying overt and covert features which are anti copying in nature is called Non Security printing. The printing of images incorporating several kinds of overt and covert features which are anti copying in nature is called Security printing. Printing text books, magazines, news papers, leaflets, pamphlets, posters, several labels, coupons, advertisements, catalogues, stickers etc are covered broadly under Non Security printing.